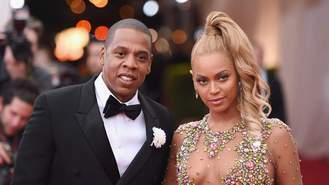 Beyonce, Jay Z, Kanye West, Pharrell Williams and Rihanna have teamed up to sue a clothing retailer which is selling shirts, hats and phone cases featuring their likeness without permission. The complaint was filed in court in New York after ElevenParis ignored the singers' warnings to stop the sales, including in a store in Manhattan's Soho district and online. The artists accused ElevenParis and its affiliates of being "habitual, willful intellectual property infringers that, without authorization, usurp the trademarks, copyrights and other rights of A-list celebrities". ElevenParis has not commented on the lawsuit. The challenged products include clothing bearing the singers' faces, phrases such as "Kanye is my Homie" and "Pharrell is my Brotha," and Beyonce and Rihanna song lyrics. ElevenParis' actions "have caused and are causing immediate irreparable harm" to the plaintiffs, who seek to recoup profits and triple damages over the allegations of trademark infringement and violations of their rights of publicity, the complaint said. Each of the artists also has their own clothing lines or collaborations with apparel manufacturers, the complaint said, generating "hundreds of millions of dollars" in sales. Earlier this year Rihanna won a legal dispute with Topshop after the store used an unauthorised photo on one of its T-shirts. Glastonbury festival organisers have donated tickets to next year's event for auction to raise money for refugees. Justin Bieber believes One Direction took his album release date for extra publicity. Robbie Williams wants to duet with Kylie Minogue again. One Direction thanked fans for their "incredible" support on the final night of their residency at The O2 in London on Wednesday night (30.09.15). Barry Manilow will tour the UK. Haim and Nelly joined Taylor Swift on stage in St. Louis last night (29.09.15). Lady Gaga has said she is “so grateful” to be named woman of the year by Billboard magazine. Pharrell Williams has launched a Happy campaign for young readers. Zane Lowe thinks Zayn Malik's solo material is ''really good''.